During the Fall of 2012, 17 designers from the Atlanta, GA area were selected to lend their time and talents to add color, furniture and flair to the United Methodist Children’s Home (UMCH) Independent Living Program in Decatur, Georgia. The space I was given to renovate was notoriously coined “the quiet room”, which measured 8′x8′ with a 10′ ceiling. The floor and walls were covered 100% with carpet. The design goal of Dawn Trimble Studio was to reinterpret the meaning of “the quiet room” into a more positive space by incorporating moments of bright color, adequate lighting and furniture/accessories that would become the backdrop to a growing library. 8’x8′ space – carpeted floor & walls! 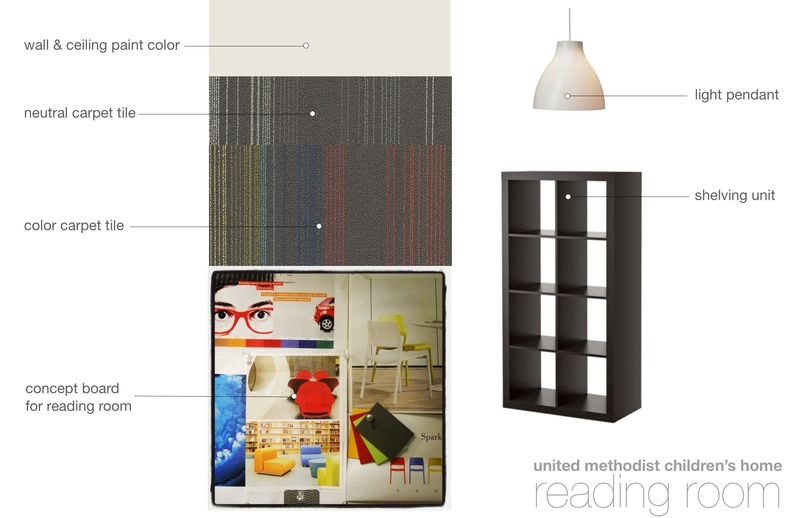 A finish palette was designed to introduce pops of color grounded by warm neutrals (warm gray and warm white). After: A reinterpreted space – bright and optimistic for the future book collectors!